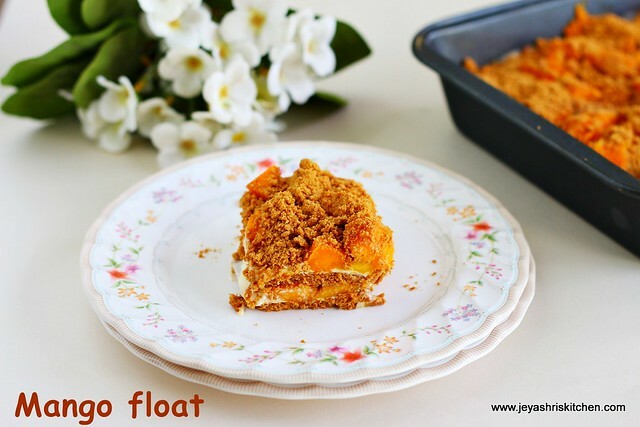 Mango float is an easy filipino dessert, which i recently learned from my helper. This dessert involves only 4 main ingredients, graham biscuits, fresh mango, cream and condensed milk. Actually Varsha wanted to make this and post for Mother's day on May 8th. But last evening she told she has loads of work to finish and couldn't make it, so i proceeded to make this mango float. It is a very simple and easy dessert and doesn't involve any cooking. So kids can easily make this for their mom as a surprise, on the occassion of Mother's day. Actually Varun is planning to make a video post on Mother's day, that it self is a surprise for me. So stay tuned for his post too. Check out my other mango recipes. * you can use digestive biscuts or krakjack biscuits or 50 50 or parleG biscutis too. In a bowl add the condensed milk and cream. Peel the skin of the mangoes and either slice it roughly or cut into cubes. Mix it nicely with a spoon. Open the graham crackers. For my Singapore readers, these graham crackers i got from Fair price. In a square glass bowl or a pan (i used my cake pan) arrange the biscuits in one layer first. Pour the cream and condensed milk over that as a layer. Spread it evenly. Add the sliced or cut mangoes on the top as a layer. Meanwhile crush 2-3 biscuits and smear it on the top. Now arrange one more layer of biscuits on this and repeat the same procedure. The cream condensed milk mixture came for 2 thin layers. Cover this with cling film or aluminum foil and keep it inside the refrigerator for 6 hours or overnight. Slice this and serve it chilled. 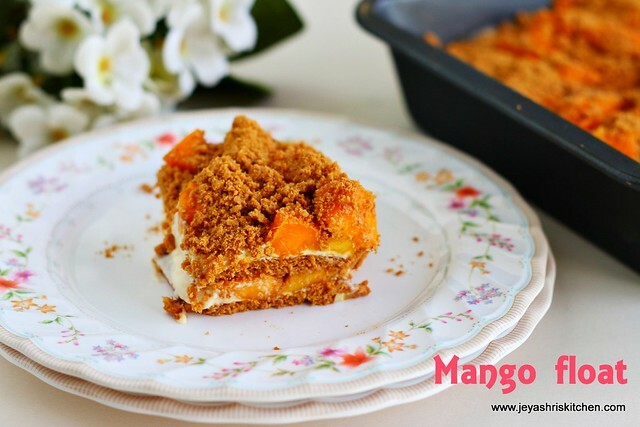 Alphonso mangoes works out best for this recipe. If you do not have graham biscuits try it with digestive biscuits and in that case use a round pan. Increase or decrease the quantity of ingredients depending upon the size of the pan. If you want you can make it 3 layers. Instead of fresh cream you can use whipped cream too. It sets quite fast and will be firm even after slicing. Jei chanceae illai, yummy receipe. Looks like international cuisine. Will definitely try.